A Post Office was established at Hotham on March 20, 1860 with J. McGibbon appointed postmaster at a commencing allowance of 70 pounds per annum. As the average amount paid to an unofficial office manager was 20 pounds approximately per annum it can be appreciated that the population of Hotham was growing. During 1861 Letter Receivers were installed at Hotham and the Post Office Report for that year states: "In 1861 a contract was entered into for the clearance of the letter receiving boxes in the City, in Carlton and Hotham, and in Collingwood and Fitzroy six times a day, or strictly speaking, for the conveyance of a letter-carrier in a light cart six times a day to all the letter receivers in the city and suburbs named In 1860 the receivers were only cleared four times a day by men on foot. During 1862 one letter carrier was employed at Hotham post office and the mail return for the year showed that there were 23,398 letters and 6,049 newspapers delivered from the G.P.O. for delivery at Hotham. The Post Office Report for 1862 also stated that mail deliveries at Hotham took approximately 1.5 to 2 hours and commenced at 9 a.m., 1 p.m. and 4 p.m. "On arrival of English mail, the regular letter carriers are assisted by supernumeraries, and time occupied in delivery is very much increased. It frequently happens, on these occasions, that the men are engaged on their walks until 10 or 11 o clock at night. In October 1867, Post Office Savings Bank facilities were made available at Hotham and by the end of December there were nine accounts. Some three years later, at the end of 1870, there were 216 current accounts. Money Order facilities had already been introduced but the exact date of this facility being introduced is not known. In June 1875 a Telegraph Office was opened at the Post Office and it would appear that this was the year in which the Hotham office was raised to official status. The Post Office report tor 1875 states that -"Grants in aid having been made by the Government to the municipal bodies at Footscray and Hotham, provision has been made for a Post and Telegraph Office in connection with the Town Hall at each place. Both buildings will be ready for occupation as soon as fittings can be provided". The Hotham Post and Telegraph Office was completed and occupied in 1876. Mr. J. McGibbon remained as postmaster at an annual salary of 250 pounds ($500) and controlled a staff of four. By 1882 the staff had increased to ten and 1884 Returns showed that the staff included a Female Telegraph operator who received an annual salary of 80 pounds, and a senior letter carrier who received £114.8.0 per annum. Mail processed at the office amounted to 88,492 articles, 5,577 telegrams were received and dispatched and 4,408 money order transactions completed. Two years later, 1886 mail has increased to 129,492 articles, telegrams, 12,326 money orders, 4,674 and Saving Bank accounts 6,822 while Mr. McGibbon was receiving 270 pounds per annum. In the 1885 List of Permanent Officers, Mr. McGibbon is shown as having been appointed a permanent officer on 1 January. During 1887 the name of Hotham was changed to North Melbourne. The 1895 Australian Handbook mentions that tram cars ran every few minutes to and from the city and that the fare was 3 pence. There were six branch banks, seven churches and about seventy-four hotels, six schools, three State schools and in the town was located the Melbourne Benevolent Asylum. There were 4,443 dwellings, 523 ratepayers and rateable property in the municipality (area 565 acres) of net annual value £156,661. The population was 22,325. The 1903 list of Permanent Officers gives the name of J. Parry as postmaster, North Melbourne. Mr. McGibbon's name does not appear in the list of Permanent Officers for 1889. However, Mr. McGibbon was the first postmaster and during, at least, 25 years continuous service he had watched the growth of the area and the office from a sparsely populated area to a large suburb - the 1879 Victorian Gazetter gives the number of electors at Hotham as 5,983. By Mr. E Pearce. Postmaster North & West Melbourne. 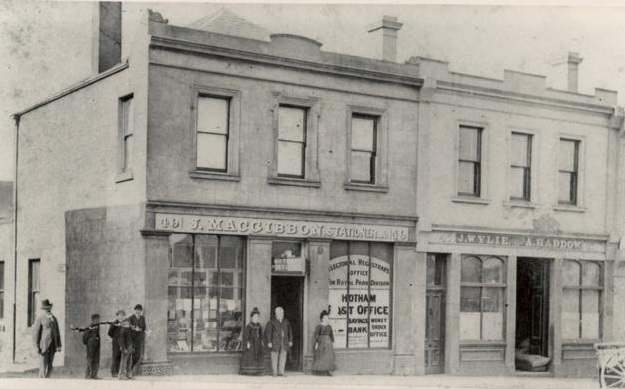 The first Hotham (North Melbourne) Post Office, in Queensberry Street. There is a group of people out side, which may include the postmaster, J McGibbon. Next door is Wylie and Haddow, a hardware shop. All these buildings are extant, although the post office was moved to the Town Hall in the 1870s.